Results show vacation rental owners could and should be doing more to market their properties. 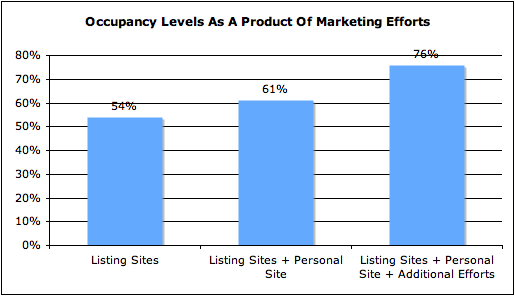 > More than half (51 percent) of all vacation rental owners use listing sites as their sole form of marketing. This group experiences the lowest average annual occupancy rate across all owner types with 54 percent. > Owners who, in addition to listing sites, use their own website and participate in further marketing efforts (such as social media) top off the average occupancy rating at 76 percent. > Almost all owners (94 percent) think they could be doing more to promote their property. The vacation rental industry is getting more and more competitive according to its owners who, while spending on average $1150 per year marketing their properties, still largely feel like they should be doing more. This is according to a recent survey orchestrated by the Vacation Rental Marketing Blog and its creator, Matt Landau, also a columnist for HomeAway and FlipKey. The survey finds that the most successful owners are both proactive and creative when it comes to vacation rental advertising. According to the survey, owners who use solely listing sites experience an average of 54% occupancy, owners who use listing sites plus their own website average 61% occupancy, and owners who take advantage of listing sites, their own website, plus additional opportunities (social media, blogging, PR) average 76% occupancy. While the past five years have brought with them huge changes in the vacation rental listing sites arena, listing sites are still very much integral to most marketing repertoires. However now, more than ever, owners must be proactive with their marketing efforts, reaching beyond traditional outlets and dedicating more time to achieve optimal occupancy rates. Vacation Rental Marketing Budgets Directly Tied To Owner Occupancy Levels? According to owners results, there is a positive correlation between dollars spent on annual marketing and occupancy rates. Owners polled spent an average of $1150 in 2011 promoting their property. Owners who spent more money typically experienced above-average occupancy rates while owners who spent less saw proportionally fewer bookings. This relationship may be hard to swallow for some property owners, who want to spend money on marketing to increase their bookings, yet need more bookings to pay for more marketing. But successful owners are quick to realize that not all marketing purchases are created equally: knowing precisely how much business is generated from individual activities allows them to gauge where to invest further resources. Successful vacation rental owners also dedicate their time to no-cost measures such as contributing to forums, commenting on blogs, or networking with local tourism providers. 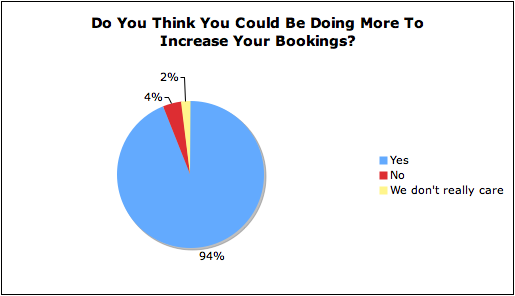 When asked to predict their success over the coming 3 years, an overwhelming 73% of owners believe that their bookings will either decrease or stay the same. This outlook is the byproduct of several major shifts in the vacation rental marketplace: more second home owners opting for vacation rental income, more investors choosing to focus on vacation rental properties (as opposed to traditional investments), and increasingly competitive hotel rates. Ironically, 94% of the very same owners surveyed, believed they could be doing more to promote their rental. 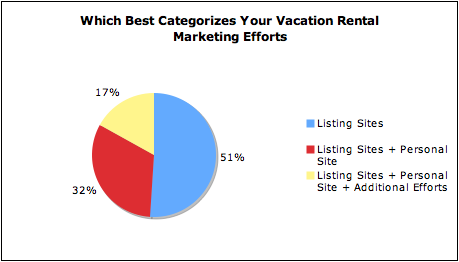 About The Vacation Rental Marketing Blog Survey: Data for the survey was collected over the weeks of July 6 - July 22, 2012. It canvassed 866 independent vacation rental owners across the globe who volunteered, without compensation, to partake in the anonymous survey.